Photo courtesy of NCAA Photos. A portion of a black net hangs on the wall of an office. For the first time in program history, the No. 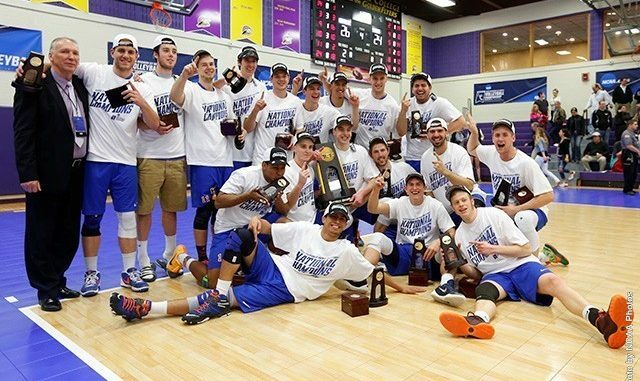 1 ranked men’s volleyball team has captured its first NCAA Div. III Tournament title, defeating No. 2 Springfield College, 3-1 (25-18, 25-23, 23-25, 26-24), in the championship match on Sunday afternoon at Nazareth College’s Kidera Gymnasium in Rochester. On the floor of that gym laid a dogpile of 19 men, all revelling in triumph. The Hawks’ win on April 24 was the first-ever NCAA title for any New Paltz team. Hawks fourth-year co-captain Christian Smith was named the NCAA Tournament MVP, while third-year opposite Joe Norman and fourth-year outside hitter Andy Fishman were named to the All-Tournament Team. New Paltz concluded their incredible 2016 season with a 33-2 overall record, marking the most wins in program history. They accumulated 32-straight wins to finish their season, with a 30-0 mark against Div. III teams. Springfield ended their season with a 28-4 overall record. Hawks head coach Radu Petrus said the team had dreamed of this moment for years. After the Hawks took the first two sets, Springfield fought back with a close 25-23 third-set win to force a fourth. Then second-year outside hitter Ben Cohen sealed the victory for the Hawks with a game, set and match-ending kill. Individually, Norman floored a career-high 21 kills and hit .444 (21-5-36). Hawks third-year middle blocker Steven Woessner finished the match with a .533 (10-2-15) clip off 10 kills and contributed four blocks (two solo, two assists). Fishman added 17 kills for the offense, while Smith dished out 51 assists and defended 11 digs. New Paltz was the victor of the two previous regular season matches against the Pride. In their past two seasons, the Hawks have made back-to-back appearances in the NCAA Tournament semifinals (2014 and 2015), but were unable to reach the finals. Petrus said a turning point for this year’s team was a loss in last year’s semifinals when current fourth-year co-captain Kevin Nardone, one of the Hawks’ vocal leaders, sparked fire into the team. Nardone said they had to start from the beginning and win the national title this season. “I remember that and will never forget it,” Petrus said. Nardone said this year’s team had a fight in them like no other team he has been on before. To get to the title match, the Hawks earned the win against No. 11 Wentworth Institute of Technology 3-1 (19-25, 25-20, 25-15, 25-17) in the quarterfinals on Friday, April 22 and advanced to the semifinals. Hawks fourth-year middle blocker Christopher Husmann notched his 1,000th career kill during the match. Husmann, a two-time First-Team All-American and an All-United Volleyball Conference (UVC) First Team honoree, became the sixth New Paltz student-athlete to reach the 1,000 kill milestone. He finished his career as a Hawk with 1,012 kills. They next defeated No. 4 Stevens Institute of Technology in the semifinals 3-1 (25-22, 25-27, 25-18, 25-15) the previous day. New Paltz had defeated the Ducks twice, once during the regular season and once in the UVC Tournament. Smith distributed a career-high 55 assists and contributed two service aces, two digs and three kills. This year, the Hawks played their season-opening matches in Puerto Rico. They lost two of the four matches, which were ultimately the only losses of the season. This made the Hawks better, Petrus said. The national title was one of the many accolades by the Hawks in their historic season. It was announced last Thursday at the NCAA Division III Men’s Volleyball Championship Banquet that Smith was named the 2016 American Volleyball Coaches Association (AVCA) Men’s Div. III National Player of the Year. Smith was also named United Volleyball Conference (UVC) Player of the Year earlier this season and UVC Tournament MVP this season making him the first New Paltz student-athlete of any sport to be named a national player of the year. His third All-UVC First Team nod came this season as well. He also collected his third First-Team All-America honor, the ninth player ever to achieve the milestone. Smith said winning the title meant the world to the team. As a team, the Hawks maintained the No. 1 ranking for six consecutive weeks in the AVCA Coaches Poll. Before winning the national title, the Hawks won their second-ever UVC Title, with the previous victory in 2014. Statistically, the Hawks were nationally ranked in the top three in winning percentage (0.943), kills per set (13.39), assists per set (12.14), hitting percentage (.371) and aces per set (2.15). At the helm, both Petrus and assistant coach Tony Bonilla earned major coaching honors this season. In his tenth year, Petrus was named 2016 American Volleyball Coaches Association (AVCA) Division III Men’s National Coach of the Year. Earlier in the month, Petrus was tallied as UVC Coach of the Year as well. Bonilla, hailing from New Paltz and a member of the SUNY New Paltz class of 1987 was awarded 2016 AVCA Div. III Men’s National Assistant Coach of the Year, announced Wednesday, April 20. His son, Anthony, is a second-year outside hitter for the Hawks. Petrus said winning the national championship was special for the entire school and he wants to keep the program up for the future. It was announced on Monday, April 18 that Fishman, Husmann, Smith and Woessner were named to the AVCA All-America First Team, while Nardone was named AVCA Honorable Mention All-America. This was Husmann’s second consecutive First Team honor. For Fishman, this was his first-ever All-America selection and he became the sixth different player in program history to win AVCA All-American honors and the fifth to be selected to the First Team. This was Smith’s third First-Team All-American honor, making him the ninth player ever to achieve the milestone. Five fourth-years: Smith, Nardone, Husmann, Fishman and fourth-year defensive specialist and libero Chris Lilley will not be returning next season due to graduation. Petrus said as a result of the win, recruits for next season may now change their mind and are thinking about coming to play for Hawks, because of their trust in the program and will to be winners. Melissa Kramer is a fourth-year journalism major who lives for sports and music.